Organic burdock shavings, 4 to 6 cm in length. Can be used in hot pot, soup, fried dishes, or kinpira dishes. 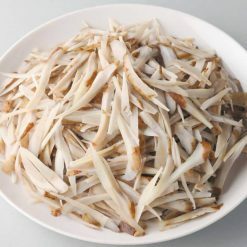 This organic burdock root comes cleaned and made into shavings so that it can be added to salads, Japanese kinpira dishes, or other dishes quickly and easily, without setting aside as much time for preparation. Any undesirable portions of the root have been removed so that the burdock can be cooked as-is, and in order to retain the flavor and nutritional value of the burdock it has been shaved with the skin on. The burdock comes in ziplock bags and has been cut into lengths of 4 to 6 cm. Burdock is often used in traditional Japanese cooking and contains antioxidants, making it a great base for kinpira dishes as well as a flavorful and unique addition to all sorts of salads, hot pots, and other dishes. When using the burdock, you can take out the portion you need without defrosting the package. For kinpira dishes, fried dishes, or hot pot, the burdock can be used frozen. When making soup or hot pot, the frozen burdock can be added when the dish is nearly done cooking and will thaw to perfection. 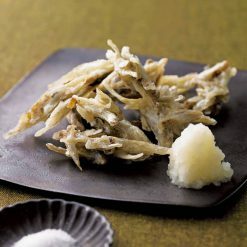 Kinpira is a traditional Japanese dish that can be made with shaved burdock, shaved carrots, or shaved lotus root (or two or more of these in combination). To make kinpira, stir-fry the frozen shaved burdock using sugar and soy sauce. Many people also like to add varying amounts of pepper to kinpira dishes for a sweet-and-hot effect, but this step can be skipped if you would rather the dish not be too spicy. For salads, boil the burdock briefly, drain it, and dry it off before use. This product contains organic burdock (China / ideally Yanagawa variety). Origin of ingredients: burdock (China). Prepared and packaged in China.